Prominent & Leading Manufacturer from Hyderabad, we offer glass reflux distillation, reflux distillation and reaction distillation. 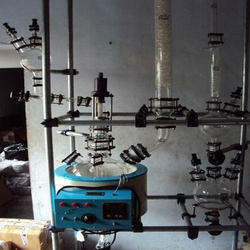 Our company is engaged in manufacturing and exporting a unique range of Glass Reflux Distillation to or clients. 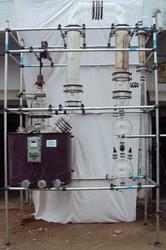 Our company is engaged in manufacturing and exporting a unique range of Reflux Distillation to or clients. As an ace manufacturer of Reaction Distillation, we have marked our name very strongly in the market. These products involve a process where the chemical reactor is also still. Separation of the product from the reaction mixture does not need a separate distillation step, which saves energy (for heating) and materials. Conversion can be increased far beyond what is expected by the equilibrium due to the continuous removal of reaction products from the reactive zone. This helps reduce capital and investment costs and may be important for sustainable development due to a lower consumption of resources. 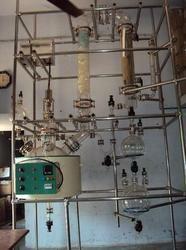 Looking for Reflux Distillation ?